Throughout the past few days the economic media was swept by successive negative results from the largest petroleum companies in the world. Corporations that for years were regarded as safe investments, providing regular dividends, are now being downgraded by the almighty rating agencies. Beyond profits, the wave of job cuts seems set to continue, with the 300 000 figure of last year in risk of being surpassed. And it is not only corporations, entire countries face the risk of default with present petroleum prices. Nigeria is the first to get financial aid from international institutions, and in all likelihood will not be the last. Pundits and all sorts of important folk continue to maul the mantra that petroleum will be cheap forever or even become free. In the mid term, the volume of petroleum that can be economically brought on the market at 30 $/b is less that 40 Mb/d (and possibly closer to 30 Mb/d). There is only one way for this situation to last: a collapse of consumption. Nigeria has asked the World Bank and African Development Bank for $3.5 billion in emergency loans to fill a growing gap in its budget in the latest sign of the economic damage being wrought on oil-rich nations by tumbling crude prices. The request from the eight-month-old government of President Muhammadu Buhari is intended to help fund a $15 billion deficit in a budget heavy on public spending as the west African country attempts to stimulate a slowing economy and offset the impact of slumping oil revenues. It comes as concerns grow over the impact of low oil prices on petroleum exporting economies in the developing world. Azerbaijan, which last month imposed capital controls to try and halt a slide in its currency, is in discussions with the World Bank and the International Monetary Fund about emergency assistance. Moves to support ailing national petroleum companies likely point to the next countries in need of foreign aid. As reported in previous reviews, Petrobras alone seems too big to fail at a planetary scale. [...] In Latin America’s largest economy, Brazil, the government has refused to rule out bailing out Petrobras, once the jewel of the nation’s crown but now a scandal-mired shadow of its former self, weighed down by $127 billion in debt, most of it denominated in dollars and euros. If it is unable to sell the $15 billion in assets it has targeted by the end of this year – a big IF given how the prices of oil and gas assets have deteriorated – Petrobras might need some serious help from Brazil’s Treasury. According to Citi, that help could reach $21 billion – just enough to plug the company’s cash hole and fix the capital structure on a sustainable basis. That’s a big payment for a government that has on its hands a widening budget gap, a 4% economic contraction, and double-digit inflation. Brazil is not the only Latin American economy entertaining a bailout of its national oil company. The government of Mexico just announced that it quietly injected 50 billion pesos ($2.7 billion) of public funds into the coffers of state-owned oil company Pemex. While countries and big corporations might have official ways to muddle through this market, the does not apply to the small companies operating in the so called "shale" resource of the US. One in 5 energy companies could be out of cash in less than six months, while 1 in 3 will hit that threshold in less than a year, according to a Big Crunch analysis. Publicly traded energy companies as a whole may have $284 billion in cash and short-term assets on their books, but more than 80 percent of that money belongs to the 25 largest companies. Those entities also tend to still have positive cash flows — even the few that are negative have enough cash to last at least two years, according to Big Crunch calculations. Yet the smallest energy companies — the ones whose names are not as well-known as ExxonMobil, BP or Chevron — are not as lucky. Dozens of small energy companies had already filed for bankruptcy by December, owing a collective $13 billion, according to law firm Haynes and Boone. Many more could join them in the next year, and some may be scooped up by opportunistic buyers. Expects say that as many as a third of American oil and gas companies and half of U.S. shale drillers could disappear into insolvency before oil prices recover. Looking at the smaller half of companies traded on the NYSE and Nasdaq, more than half of those companies are burning cash fast enough to be out within six months (based on their cash flow in the last two reported quarters). Right and left there are news of cancelled projects and ensuing declines in extraction. This will become visible in the monthly data very soon. [...] Many companies have already conceded that they do not have a future in an economic and regulatory regime that rewards lower costs and lower emissions and penalizes big polluters. According to Wood Mackenzie, an energy consulting company, 800,000 barrels a day of oil sands projects have been delayed or canceled over the past 18 months. That amounts to 16 new projects that have been put on hold or canceled. CNOOC, which recently suspended production at its Long Lake tar sands facility, is reportedly one of a number of other companies looking for ways of bailing out of the tar sands. Even the Canadian Association of Petroleum Producers has backed away from its once-rosy forecasts for tar sands expansion. In 2013, it predicted that tar sands production would increase from approximately 2 million barrels per day to 5.2 million barrels per day by 2030. In 2015, CAPP reduced estimated 2030 tar sands production to 4 million barrels a day. Tar sands output could fall even lower, analysts say. The North Sea is not exactly the most expensive petroleum and gas region in the world, therefore one should extrapolate the news of fields in risk of shut in because of the present price. For smaller fields this shut in may actually mean an early end of life. As many as 50 North Sea oil and gasfields could cease production this year after a collapse in crude prices to 12-year lows, industry experts have warned. This would accelerate the North Sea’s decline, potentially bringing forward billions of pounds in spending on decommissioning. Dozens of smaller fields with high production costs that are approaching the end of their lives have been identified by energy consultants Wood Mackenzie as prime candidates to be shut. Halting output is the first step towards abandonment. This, in turn, could speed up decommissioning — when operators abandon fields and dismantle decades-old infrastructure, including platforms and pipelines. Iraq was one of the rising stars the past few years, in spite of the Sunni-Shiite war and the rebelling Kurds. The country indeed brought extraction over 4 Mb/d, but the years of war have left many regions in shambles. Tens of thousands of trapped Iraqi civilians are running out of food and medicine in the western city of Falluja, an Islamic State stronghold under siege by security forces, according to local officials and residents. The Iraqi army, police and Iranian-backed Shi'ite militias - backed by air strikes from a U.S.-led coalition - imposed a near total siege late last year on Falluja, located 50 km (30 miles) west of Baghdad in the Euphrates river valley. The city's population is suffering from a shortage of food, medicine and fuel, residents and officials told Reuters by phone, and media reports said several people had died due to starvation and poor medical care. Insecurity and poor communications inside the city make those reports difficult to verify. In parallel to petroleum, gas extraction in the US is also entering a decline. It is far too early to call this a permanent peak; my feeling is that it is not - the resource is far vaster than petroleum. However, it is important to note this trend is settling in while the country is still a net gas importer. The U.S. 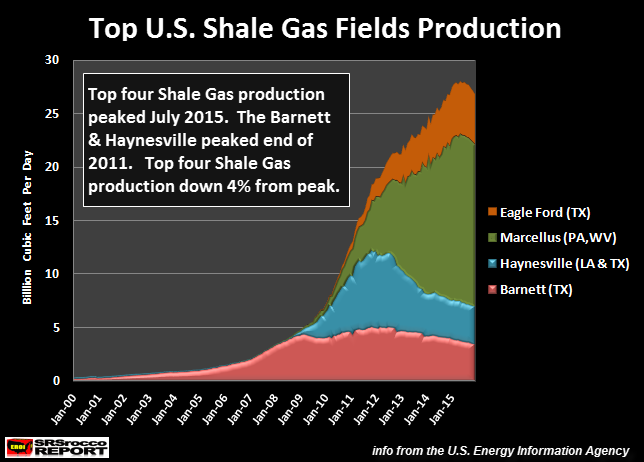 Empire is in serious trouble as the collapse of its domestic shale gas production has begun. This is just another nail in a series of nails that have been driven into the U.S. Empire coffin. There are no doubts left on what caused the surge of earthquakes in the US state of Oklahoma. In 2015 there were more than 900 events of magnitude 3 or higher - a stress frequency that most buildings were not designed to withstand. However, local authorities seem powerless to stop the disposal of drilling waste liquids. There is a general consensus in Oklahoma that the record-breaking number of earthquakes occurring in the state are caused by the disposal of fracking wastewater in injection wells. But there’s no agreement on what to do to stop them. Spotts’ group has called for a moratorium on injection wells that dispose of fracking wastewater. “Shutting the wells down stopped the earthquakes that hit Arkansas. That is what we need to do here too,” Spotts said. Among the mainstream stories of the day are the primary elections for candidates to the President of the USA. Ethanol seems to play an important role in this story, that is unlikely to be acknowledged by the mainstream media. [...] Currently, 40 percent of the U.S. corn crop goes to ethanol production – up from just 10 percent as recently as 2005. Most of the unleaded gas available in the United States is actually 10 percent ethanol and 90 percent gasoline. This fuel is labeled “E10″ gas. Which would be ok … if that’s what the market wanted. But it’s actually what the government (and corn lobby) want. And now they want more. Specifically, they want ethanol concentrations upped to 15 or even 25 percent (E15 and E25). And they want whomever is nominated and ultimately elected president to make it so. Big money – and big pressure. [...] And ethanol in higher concentrations – such as E15 and E25 and E85 (15 percent, 25 percent and 85 percent ethanol, respectively) will cause physical damage to engines and fuel systems not specifically designed and built to handle high-alcohol-concentrations. Alcohol is by nature corrosive – and it attracts moisture. If you read your vehicle’s owners manual you will find explicit warnings about using any gasoline with more than 10 percent ethanol (E10) unless the engine was designed for it – and an advisory that any damage resulting from its use will not be covered buy the vehicle’s warranty. To finish off on a more positive note is something that more resembles an anecdote. Once in a while there are news like this, so absurd that can not possibly be made up. And in this case it was the front page at the Financial Times for a few days. There is not even an attempt to quantify the energy or financial return on investment. Mining in space will take a leap from the realms of science fiction towards commercial reality on Wednesday when Luxembourg launches an official initiative to promote the mining of asteroids for minerals. Luxembourg has a long-standing space industry and played a significant role in the development of satellite communications a generation ago, including setting up SES, one of the world’s largest satellite operators. In collaboration with US and European commercial partners it now aims to help create a space industry to exploit asteroids for metals and other materials that are scarce on Earth but plentiful in “near-Earth objects” (NEOs). NEOs typically orbit the sun in trajectories tens of millions of miles away — much further than the moon but closer than Mars and within easy reach of unmanned spacecraft. That is it for this time, have a good week.